CARFMS 2016 will be held in Winnipeg, Manitoba, hosted by the Conflict Resolution Studies and International Development Studies departments of Menno Simons College. 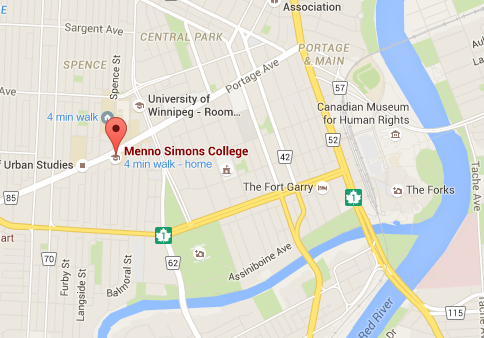 Menno Simons is a college of Canadian Mennonite University and affiliated with the University of Winnipeg. Conference events will take place in downtown Winnipeg at Menno Simons College (520 Portage Avenue) and the University of Winnipeg’s Eckhardt-Gramatté Hall (515 Portage Avenue). The United Nations Universal Declaration of Human Rights (Article 13) states that everyone has the right to freedom of movement within and across borders. Today, unprecedented numbers of people are being denied this fundamental freedom. The Office of the United Nations High Commissioner for Refugees estimated in its 2014 Global Trends Report that war, conflict, and persecution have displaced some 60 million people worldwide, the highest number on record. New waves of “boat people,” displaced by violence, are crossing the Mediterranean Sea, the Bay of Bengal, and entire oceans to seek safety and freedom only to perish on dangerous journeys or be detained or refused entry at their destination. This is an opportune time to highlight and discuss the humanitarian crises triggered by forced migration, exchange research knowledge and practical expertise, and propose concrete actions that will restore the right to free and safe movement for all peoples. The 9th Annual CARFMS Conference will provide a forum to explore the question: How can host states, origin states, the international community, private citizens and civil society act to address the escalating global crises triggered by forced migration? Building on the strengths of Menno Simons College, the event will bring together academics, researchers, students, government officials, lawyers and lawmakers, community organizations and practitioners to explore and recommend theories, policies and practical responses relating to “Freedom of Movement” from the following perspectives: (1) Conflict Resolution and Peacebuilding; (2) Human Rights; (3) Development; and (4) Methodology and Knowledge Production. Through programmed sessions, local field trips and activities, and networking opportunities, the conference will mobilize knowledge and increase access to innovative and interdisciplinary research on refugees, forced migrants, and resettlement. Three keynote addresses, open to the public, will be delivered by prominent speakers, and three plenary sessions will feature additional leaders, scholars and practitioners who are directly involved with refugee and forced migrant work. The conference will also include individual papers, organized panels and roundtables, film screenings, video documentaries, news media and poster/photo exhibits.